5.0 out of 5 starsSmall but handy!!! Although the product itself is great, the low rating is because it was definitely a previously opened item, as you can see in pics. It had been opened and taped back and even the packing was torn from the bottom. Couldn't return as it was a gift for my kid and he was too excited to let it go. It is quite small (a pocket gun) but works very well. My 5 year old found it a little hard to pull the loading lever, but soon he got the hang of it and is now enjoying it a lot. His hands actually seem to be gaining strength by pulling this. 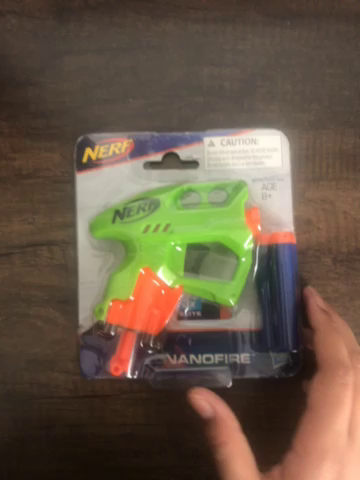 I bought a bigger Nerf elite disruptor and 100 bullets seperately. Now we both play and it's great fun! I bought it for my son and he is really enjoy playing with it. Build quality is good and worth a penny. 5.0 out of 5 starsGreat quality and reasonable price. Good quality. Original Nerf product. The plastic used is non toxic and very strong, no sharp edges. Very well constructed. Comes with 3 soft foam "bullets". The foam bullets are soft and not traumatic unless you fire into someone's eye. But they fall apart easily so I'd recommend you buy lots of bullets separately. Nerf bullets are expensive but many third party sellers have 100 pack bullets for around Rs 350. I would recommend this product if you want a relatively safe gun toy for your child. I liked it because it directly his the target. My Son said this.